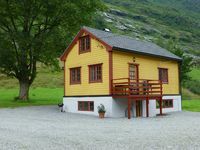 Properties in Sogn og Fjordane average 4.5 out of 5 stars. Property 6: Apartment with 4 beds / 2 bedrooms. Go hiking, trout fishing, glacier and rock climbing. Charming holiday home / small farm for rent in Ofredalen in Årdal municipality. Property 25: Charming holiday home / small farm for rent in Ofredalen in Årdal municipality. Cottages on the waters edge a 5min walk from Flåm station. Boat with motor incl. 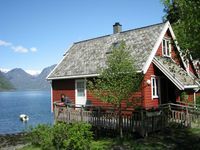 Property 32: Cottages on the waters edge a 5min walk from Flåm station. Boat with motor incl. My wife and I have stayed in a lot of vacation rentals and this was the first that completely outdid itself. The photos do it no justice - you MUST experience it to see how incredibly wonderful it is. Immaculately clean, stunning views, and everything and anything you could ever need was somewhere to be found in this pristine, warm and lovely cabin. I don't think we'll ever stay anywhere better in the world. Anders stopped by to show us how the boat works (after he took the time to bale it for us), and we were blessed with great weather to take our own tour of the fjord surrounding Flam. Incredible. Needless to say we will never stay anywhere else when we're in Flam and now we absolutely HAVE to come back because every time I think of this cabin I can't help but giggle with delight.